The Milwaukee Brewers have re-signed relief pitcher Francisco Rodriguez to a two-year deal with a team option for a third season. According to Tom Haudricourt of the Milwaukee Journal Sentinel, the total value of the deal is $13 million. The contract pays Rodriguez $3 million in 2015, $6 million in 2016 and the remaining $4 million is deferred. 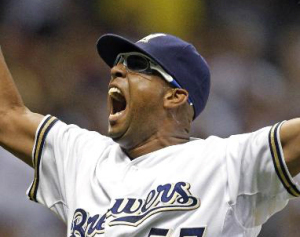 In 2014 Rodriguez made 69 appearances for Milwaukee, saving 44 games and posting a 3.04 earned run average as a National League All-Star.